The text here, dating from 1990, is abbreviated and revised from the original. Uprooting War is unlike the numerous treatments of the dangers of war, the benefits of disarmament or the need for government or citizen action. It is about developing strategies for grassroots activists to challenge and replace the war system. Brian Martin presents a wide-ranging critical analysis of social institutions and as well draws upon his experiences as a social activist. The peace movement has used methods such as lobbying, rallies and civil disobedience. All of this has been important, but it has had little impact on military races. The trouble is that only a few campaigns seriously challenge the hierarchical power structures which underlie preparations and resort to war. Uprooting War aims to encourage serious thinking about strategies against war which involve confronting institutions such as the state, bureaucracy, the military and patriarchy. Some of the alternative directions examined are social defence, peace conversion, and building self-managing political and economic institutions. 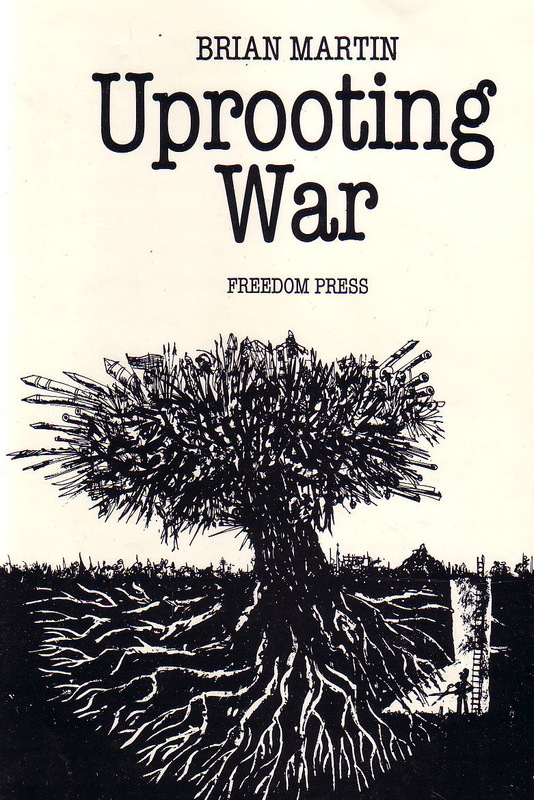 Uprooting War was originally published by Freedom Press in 1984, and this edition remains in print. In 1989 I prepared a revised English text for the Italian edition (La Piramide Rovesciata: Per Sradicare la Guerre, translated by Tina Ammendoni: Molfetta, La Meridiana, 1990). It incorporated a number of changes from the Freedom Press original. Two chapters on antiwar strategy during and after a nuclear war were omitted, in the interests of brevity. For the same reason, some of the accounts of campaigns in Australia were shortened or deleted. The new chapter 11 on science and technology was considerably revised from an original chapter on "the administrative class." The new postscript was also partially adapted from the same chapter. The original chapter on the individual, with four personal stories, was also omitted; an Italian replacement did not eventuate. I went through the text and tried to improve the expression, and also add a few recent examples. Accounts of campaigns were brought up to date where there was information available; in some cases campaigns had faded from view with little documentation, understandably. Finally, the list of references was revised and updated. The web edition is almost identical to the 1989 text. Chapter 12 on state socialism, written in the 1980s, has been overtaken by events. I have left it unchanged. A couple of additional comments have been added, in [brackets]. The original description of the Kapp Putsch has been replaced by the one in Social Defence, Social Change (Freedom Press, 1993). The chapter on the individual, from the 1984 original, is available. This book would not have been conceivable or possible without the experience, insight and support provided by many activists over the years, especially members of Canberra Peacemakers and Friends of the Earth Canberra. Many of the ideas presented here were raised in or stimulated by books and articles I have read or conversations with researchers and activists, and detailed attribution is impossible. Quite a number of people read portions of the draft of the book and offered useful comments. Comments on individual chapters or specific points were given by Godfrey Boyle, Barbara Clark, Hugh DeWitt, Mark Diesendorf, Dave Elliott, Fred Emery, Merrelyn Emery, Will Firth, Ulf Norenius, Meredith Petronella, Hans Sinn, Glenn Watkins and Trevor Williams. Extensive comments on several or all of the chapter drafts were provided by Phil Anderson, Cheryl Hannah, Janet Hunt, Val Plumwood, Rosemary Walters, Ian Watson and John Zube. It should go without saying that none of these people necessarily agree with all my views.